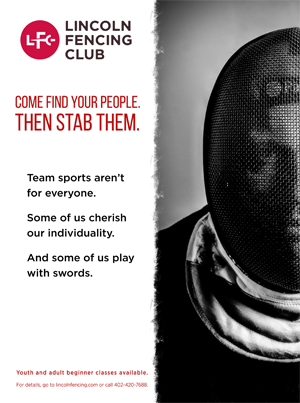 Welcome to Lincoln Fencing Club. Our mission is to provide a safe, family-centered, personally challenging fencing program that develops people as well as fencers. experienced fencers who want to reach their maximum potential competitively. We welcome new fencers of all ages. Anyone interested in joining can attend any of our sessions to observe fencing and ask specific questions. If you’re interested in trying out fencing but worry about expensive equipment—relax. LFC provides all equipment for those who wish it. While we do encourage fencers to buy their own equipment as they continue the sport, we will provide equipment for as long as a fencer needs it. LFC was founded by Kit Boesch, Rick Kohn, and Damon Scaggs in 1980. The club consisted of six fencers who dusted off their foils and decided it was time to have fun! Kit Boesch served as head coach. She was a competitive fencer for more than twenty years. She coached two youth clubs in Wisconsin and spent seven years coaching at Ohio State University. She began her career by winning the under-nineteen Wisconsin Championships and has now retired from competitive fencing. She is proud of the silver medal she earned at the National Senior Championships. As the fencing club grew, we decided to hire the former Olympic coach for Hungary Janos Gasparin. Janos was junior national foil champion of Hungary at age sixteen and on the national team from 1972 to 1974. He was slated to be a member of three Olympic teams in 1976 but was denied a spot because his family were not card-carrying members of the Communist Party. He and his wife, Kati, who has continued to compete and earn many national medals herself, became involved with Lincoln Fencing Club in April of 1995. The club ran under the direction for Janos and Kati Gasparin (with Kit keeping a close eye) till 1997. After Janos and Kati left, Kit took over again as head coach. LFC decided to start the Icicle Invitational, which continues to be a great competitive tournament that attracts fencers from around the Midwest each January. In 1998, once again LFC decided to hire a foreign coach: Archil Lortkipanidze from the Republic of Georgia. He served as head coach till 2000, and then Kit took the job over again till 2002. Several fencers banded together as coaches, and in 2003, Kristian Anderson took over as head coach. In 2008, Kristian stepped down as head coach, turning the reigns over to Cassidy Kovanda. Cassidy served until 2016, and today, Brad Tucker serves in the roll of head coach. Today, LFC has more than seventy-five members and continues to grow. It focuses on competitive fencing in all three weapons: foil, épée, and saber. LFC is a 501(c) nonprofit organization located at the corner of 27th and O Streets. We sponsor several tournaments and offer classes for youth from age eight and adults up to age seventy-five (and, in a few cases, older than that). LFC promotes directors and fencers to gain top-level ratings. We demand safety, mutual respect, and the opportunity for everyone to fence.